I must warn you… this recipe is neither low fat nor lactose free. But it is good. And simple. 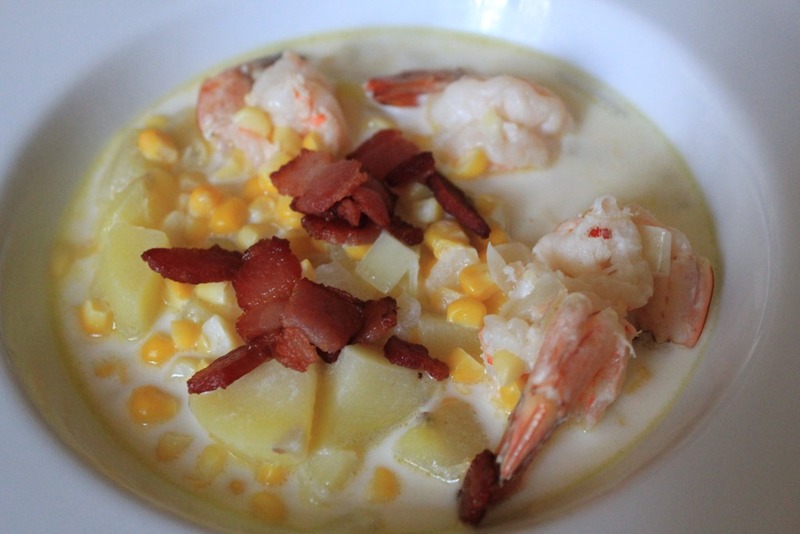 It is a rich and creamy chowder sure to warm you from the inside out. In a large pan, add 1 Tbsp. butter and melt. Sauté corn until just beginning to get tender, appx. 3 minutes. Add diced onion and salt and pepper. Continue to sauté until onions begin to get translucent, appx. 5 minutes. Add shrimp and cook until pink. Put cooked corn mixture into a medium sized pot. Add the diced potatoes. Pour in milk, cream, and butter. Butter should be cut into smaller pieces to help it melt faster. Heat over low heat. Add salt and pepper to taste. Do not let the chowder boil! Allow it to simmer for 15 – 20 min. Meanwhile, in a small pan, cook diced bacon until crispy and set aside to drain on a paper towel. Serve chowder in a shallow bowl with the bacon sprinkled on top. Yum!